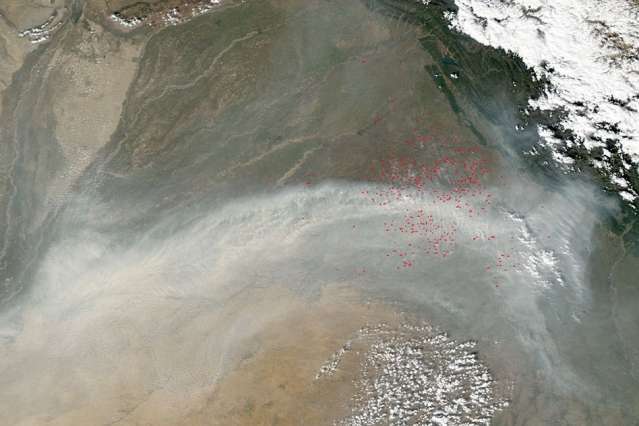 On the Indian subcontinent, the widespread burning of firewood, coal, agricultural waste, and biomass for energy disperses black carbon particulates into the atmosphere. These manmade aerosols not only pollute the air, but also form an "atmospheric brown cloud" that's disrupting the local climate. "Aerosols can influence the supply of moisture, and a small perturbation can play a big role," says study co-author Chien Wang, a senior research scientist at MIT's Center for Global Change Science and in the Department of Earth, Atmospheric and Planetary Sciences. "Pre-monsoonal aerosols push rainfall to the northwest, drying out central India. Aerosols emitted during the monsoon season send the moisture supply in a different direction, and dry out most of the subcontinent." The study produced its findings by running a global climate model to simulate the impacts of aerosols emitted before and during the monsoon season in all but the northeast region of India, which is not well-represented in the model. The effects of pre-monsoonal aerosols—increased rainfall in the northwest and decreased rainfall elsewhere, particularly in central India—persist during the monsoon, further reducing soil moisture in central India. Aerosols emitted during the monsoon lower rainfall totals not only in central India, but across the country. When aerosol emissions are simulated throughout both periods, impacts during the monsoonal period are similar to those resulting from monsoonal aerosols only.